By Joydeep Bhattacharya in UI/UX. Updated on September 6, 2018 . You can’t control and manage what you can’t measure. Thankfully, Google Analytics’ reports are your perfect knowledge mechanism for measuring, planning, and managing web campaigns. 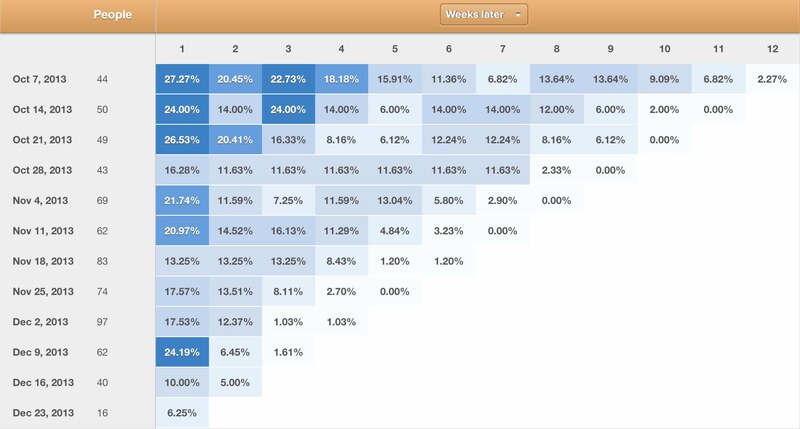 For a long time you could only perform a cohort analysis on Google Analytics via the segmentation feature, which was nothing more than a publicized web hack. But with the availability of a dedicated cohort analysis tab, you can now perform a conclusive analysis that provides you with the necessary behavioural data that you can leverage to fine tune your content, keywords, and web marketing strategies. You can combine all of your individual cohort reports and merge them in a proper PDF in order to present the data in a manner that helps to increase a campaign’s effectiveness. In my last post – A Look into: Cohort Analysis in Google Analytics – I detailed several business benefits of performing a cohort analyses. In this second part, I’m going to share the essential analyses steps that facilitate a correct cohort analysis. (1) Make sure that you have a question that needs answering. That’s because the whole point a cohort analysis is to obtain actionable information for a specific purpose, such as a company seeking data that can help improve its business process, product manufacturing, and even overall user experience. So, to make sure that these processes can be optimized, it is essential that you ask the right kind of question in order to find the right solution. Again – ask the right and precise question. (2) Always define the metrics that will enable you to find the right answer to your question. A comprehensive cohort analysis requires the recognition of the specific properties of any event. These events might include records of users checking out, with advance metrics that let you know how much a user has paid. (3) Identify your situation specific cohort (that is, cohorts that are relevant to your analysis). The process of creating a cohort involves analyzing all real-time users and targeting them, or performing attribute-based contributions to obtain relevant differences that will highlight their characteristics as a specific cohort. (4) Once you have all your data, you can now proceed with performing your cohort analysis. The reason that cohort analysis is so commercially popular is because businesses can use the results to identify shortfalls within their company. In a general scenario, the information required to perform a cohort analysis is stored within a physical or virtual database of some kind and has to be exported into spreadsheet-based software. You can use tools like MySQL or Microsoft Excel to get this done. For example, if you’re looking to study consumer purchase behavior, you would want your results to be legible and presented in some form of a data sheet or table of data that includes a single record per customer purchase. Correspondingly, every individual record possesses a customer’s ID that is typically either a unique alpha-numeric tag or a valid e-mail address, date, location and time of purchase, total purchase value, and the customer’s first date of purchase, typically known as the “cohort date.” And in your general cases, you can always use MySQL query to bring up such information. You would however, want to ideally include additional characteristics such as a customer referral source, the SKU of their first purchase. And to make your work much easier, you can use tools like metrics to give you automatic access to these attributes. To create a cohort identifier you’re going to open the data you’ve extracted into Excel. After you’ve pulled the “cohort date” characteristics, you can conduct the ever-so popular cohort analysis in which you can do things like compare cohorts of customers based on when they made their first purchase. So, in such a case where you might to group your cohorts based on a specific month in which they actually made their first purchase, you have to first translate each of your “cohort date” values into a virtual bucket that will be a representation of the year and month of your customer’s initial purchase. After you’ve ascertained the cohort which your customer attributes to, you also have to regulate the “lifecycle stage” of your analysis at the event that occurred for that particular cohort member. If your customers make a purchase at any point of time and the subsequent one after a few months, they would fall under the cohort of their initial purchase date. Consequently, their first purchase would also be in that initial lifecycle stage and their next purchase would fall under the second lifecycle stage. In order to accurately calculate the lifecycle stage, you’ll also have to ascertain the amount of time that has lapsed between your customer’s first purchase and the purchase that you specify. The final step of your cohort analysis is to create pivot tables. These tables are critical to your analysis because they allow you to calculate a collective like a sum or even an average, across multiple dimensions of your cohort data. If you’re using the pivot table for your business, you’re mostly like going to have to create one that conducts a SUM of customers’ transaction amount, which shows one row for each cohort and one column per relevant time-period. If you have trouble viewing your data, you can easily visualize it on the most basic of Excel line graphs. Though cohort analyses have mostly been relied on for user retention and user behaviour studies, the Google Analytics avatar of the same can be leveraged by web analytics experts to study metrics like page views, session durations, goal completions. There’s enough in there to help you make more sense of your users’ behaviour, effectiveness of your marketing tactics, and success of your promotions mix; trust this guide and begin your advanced cohort analyses with Google Analytics.